Basic does not mean insufficient. Everything one could need is available, within the range of accommodation of the kind. CHECK IN from 13.00 to 2.00am (2.00 in the night). For Check-In AFTER MIDNIGHT YOU please NEED to provide flight information and mobile number – contact me by mail after doing the reservation. (it's a little property with none for night shift so I have to organize myself for guests who check in very late). BAG DROP from 8.00am (not before). 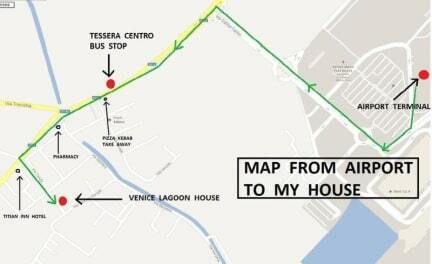 Venice Airport is about 1 km (0.6 miles), you can walk from/to the airport in 15 minutes or 2 minutes by bus – line 5 or 15. You can reach Venice downtown by bus number 5, it runs 4 times every hour, the ride takes 20 minutes. Free Wi Fi. Common living room with microwave, electric rice cooker, electric kettle and fridge. PARKING area in the street in front of the house. Inside garden parking available upon request. This was the perfect stay for our night before leaving Venice! It was only a 15 minute walk from the airport and it was quiet and clean. Luca, the owner, was very friendly and helpful. If you need one night to crash before flying out, this is the perfect option. It was so perfect. Kindly people and very good location. We had a great one night stay here! The host kindly stayed up to check us in after our late night flight, and then gave us a lot of advice on how to get into Venice the next day, which we really appreciated. The facilities were great and really clean. The location was perfect, only 20 minutes walk from the airport. Thank you very much! The host graciously waited for me to arrive past midnight and got me checked in and settled in. I had 3 hours to sleep before a VERY early flight, and he showed me the route to walk to the airport. It’s a convenient place to stay for these types of situations and the walk was only about 20 min to the airport. Overall great experience and I was really grateful for a place to crash for 3 hours. Luca wasn’t in town but he made sure to have everything everything ready for me to auto check in and out! He sent me previously emails with a lot of helpful information about transportation and descriptions about the place! If you need to be early morning at the airport, this is a fabulous location to catch up the bus at 4:45 AM and it only took 4 minutes to get there! You're getting a room in family's house. Not exactly the hostel we were expecting, but the people who run it are quite nice. Right next to the airport. Great location and directions to it. Luca was very friendly and informative. The cost on Saturday night was much higher than Sunday but I still highly recommend the place. We stayed with Luca for three nights during the carnival. The hostel (which is basically a house) is located outside the main island of venice and within walking distance from the airport. However, getting to Venice is easy (20 min bus ride) and there is nice food at good prices nearby. Luca is a great host and always willing to help or just chat with you. Overall the place is a great value for money and when I come back to Venice it will be my first choice of accommodation.